Do you have mice in your coop? Those pesky little visitors stop by looking for spilled feed, a dry place to hang out (or even worse, to make a nest – and produce more pesky little visitors). Many rat and mouse baits are toxic to cats, dogs, and chickens – and all of these animals will happily make a quick snack of a rodent who’s had a bit too much toxin. So what to do? Put your feeder at the height of the chickens’ backs. This will prevent them from swishing food onto the ground. Switch to a pelleted feed to minimize spillage. Purchase a weight-activated feeder. These feeders will open for chickens — but not for mice, rats, or sparrows! Try keeping your feeder in the coop all the time – and make sure to close the birds – and their feeder — in at night. Rats and mice are nocturnal (out most often at night), and this will limit their access to prime-time feeding. Mix hot pepper into your feed. Birds cannot taste capsaicin, the compound that makes peppers “hot,” but mammals sure can! Just be sure you don’t breathe in the pepper dust or touch your eyes while handling the feed. Build a better (nontoxic) mousetrap. Check out this idea from Backyard Chickens: Drill a hole in the bottom of a soda can. Place can on a dowel rod so that it spins. Drill holes in the top of a 5-gal. bucket so that the dowel rod (with the soda can on it) fits in the holes and spans the diameter of the bucket. Smear peanut butter on the soda can. Place a ramp up to the bucket. The mice will smell the peanut butter, run up the ramp, try to get the peanut butter on the spinning soda can, and fall into the bucket. Dispose of rodents as you see fit! Help your chickens beat this crazy hot and humid weather! As the temperatures and humidity soar, you’ll want to help your hens keep cool. A few tips for helping your hens beat the heat. When temperatures reach the mid-80s, your birds will probably start panting. In temperatures above 100, your birds may suffer heatstroke. Here are some tips, excerpted from my class on chickens and heat, to prevent that. If you notice that the birds are listless and lethargic (signs of heat stress), consider bringing them into a cool basement or to an air-conditioned mudroom (in a dog crate or portable cage). Wondering how your four-legged friend will handle having two-legged, feather friends? Meet Ian and Kristy Dilworth, owners of Smart Dogs. They recently called me out on a chicken consultation and invited me to see their dog training and lodging facilities. They have worked with clients who have chickens and were interested when I mentioned that many of my clients ask about chickens and dogs. If you’re interested in boarding or training, give them a call! Are there any burning questions about chickens you’d like to have answered? What practical advice would you appreciate? What aspects of chicken keeping are still challenging? I’m working on pulling together a new class on chicken keeping, and I’d like your input! Write me a message below with your ideas. Thanks very much! We’re due for some VERY cold temps here in Chicago (in the negative degrees F, and windchills even lower), and a number of questions have come up about chickens and cold temps. Here’s a list of ideas I’ve compiled. If you have suggestions, feel free to post. Keep bedding loose and dry. Deep bedding helps trap heat. Cover the coop and wire-covered areas (such as the run) with a plastic tarp, greenhouse plastic, dropcloth, or plywood. Fill in cracks and crevices in the coop with newspaper or cardboard. The coop should not be completely airtight; allow some air circulation to prevent frostbite. Stack strawbales around the sides, esp on the sides with northern/western exposure to act as insulation. Make sure roosts are in the least drafty place in the coop. If ceiling is higher than 2 feet above the chickens, you may want to install a heat lamp above the roost that will turn on when the temp is below 35 degrees. Be sure that the lamp cannot be damaged by a flying bird and that it is not a fire hazard. If you bring the birds indoors, make a gradual transition to warmer temps – e.g., from 0 degrees to 20 degrees to 45 degrees, NOT from 0 degrees directly to 45 degrees. Note that overheating can lead to obese birds. If you supplement heat, set the thermostat to just above freezing. Watch toes and combs/wattles for signs of frostbite. A little petroleum jelly on combs and wattles can prevent frostbite *however* be careful not to overapply – petroleum products can coat the feathers, reducing their insulating properties. Do not allow them to be out in the snow for extended periods of time to avoid freezing their toes. Clear snow out of sections of the run so they don’t have to walk in it. If chickens do get frostbite, treat with aloe vera, can use aspirin solution for pain (three 325 mg tabs per 1 gal water), don’t massage, don’t heat up rapidly. Allow tissue to die/fall off naturally. Check water several times a day to be sure it’s not frozen. Feed mash mixed with warm milk or water. Some folks feed warm oatmeal. Make sure it is not hot, so the birds don’t burn themselves. Provide a few handfuls of scratch grains in the evening before the hens go to roost. Can also feed a handful or two of scratch in the AM. 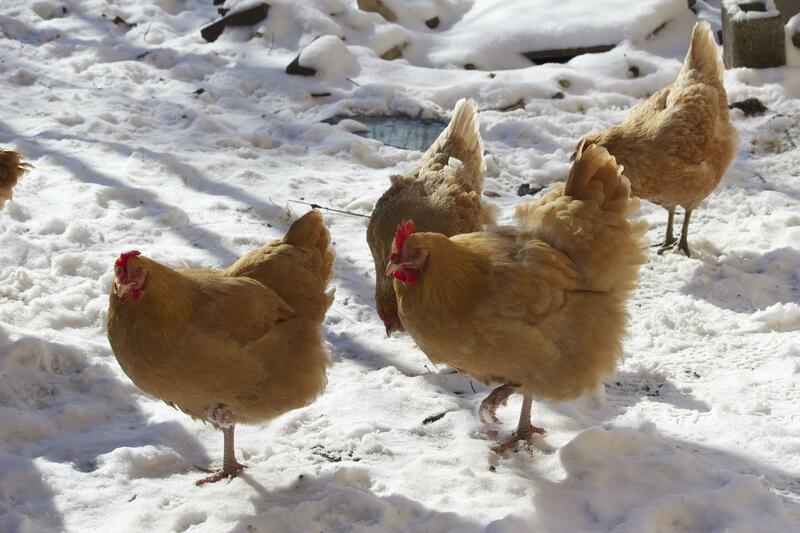 Extreme temperatures can stress the birds and cause hens to go out of lay. Collect eggs so they do not freeze and lead to egg eating.